Based on reviews from 5,309 users. Learn how our rankings work or see our guide to Adidas Campus sneakers. Updated Apr 2019. When it comes to iconic and timeless kicks, Adidas seems to have no shortage of shoes. The brand has a lot of legendary sneakers: from the tennis-inspired Stan Smith to the street style staple Superstar. For a low-key shoe, there’s the Adidas Campus, famously sported by the Beastie Boys. It was even worn by two of the hip-hop group's members on the 1992 "Check Your Head" album cover. The model was introduced as court footwear in the 1980s under the Adidas Originals line. While never getting the same top billing as other shoes, it has retained a solid spot with sneakerheads. Ever underrated, these kicks could be casually lurking somewhere in the background at any time. A few years after their introduction, the hip-hop world adopted Campus shoes. Many skaters also favored the sneaker in the 1990s due to the grip offered by its vulcanized outsole. In 2016, the brand re-released the model with fresh new colorways, including Adidas Campus shoes in black, grey, and navy. Ever since its introduction, the Campus shoe has been redone in many versions. The suede low-top was transformed into a casual essential, worn by men and women for a variety of activities. With a street-ready appeal, the various models have become favorite pieces for pairing with a variety of outfits. Below are the most popular shoes from the Adidas Campus collection, listed according to whether they are inspired by basketball, skating or football or a collaborative edition. This low-top court sneaker launched the Adidas Campus series way back in the 1980s. Its predecessor, the Adidas Tournament, was released in the early 1970s, featuring an all-suede construction. During the 1980s and 1990s, the sneaker made waves in the hip-hop community. Its steady rise to popularity has resulted in it being released in different iterations over the years. Aside from The Beastie Boys, these sneakers were worn by such music artists as Korn and Limp Bizkit, as well as supermodels Gigi Hadid and Kate Moss. These Adidas Campus shoes have blue, red, pink, and many other color options. This shoe has a sock liner made up of an Ortholite insole that’s durable, cushiony, eco-friendly, and breathable, giving comfort to the foot. It’s a budget-friendly shoe at only $90. 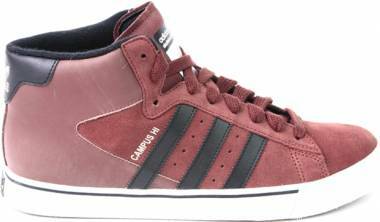 These Adidas Campus men’s shoes are offered in sizes 5-10. Meanwhile, women can get their size by going down by 1.5 in the men’s sizes. A few wide-footed buyers found the shoe’s toe box to be narrow. With its soft suede upper and ultra-grippy vulcanized outsole, the Adidas Campus Vulc II is at home on and off the board. Its skate-ready details make the shoe suitable for the hard wear caused by skating. At the same time, the shoe retains the signature details of the original Campus. Among its upgraded features is the double protection offered for such tricks as high jumps and flip tricks. This sneaker features a sleeker silhouette along with a double layer of foxing tape along the toe for extra durability. These Adidas Campus shoes offer bang for the buck at only $70. Men’s 6-14 sizes were issued. It runs true to size. Women are recommended to go a full size down for an optimal fit. Introduced in 2008, the Adidas Campus Vulc was the first vulcanized shoe to come out of the Adidas Skateboarding line. Slimmed down editions such as the Adidas Campus Vulc II ADV were later released. These low-top Adidas Campus sneakers are perfect for transitioning between the skate park and the streets in style. Additional comfort and he tongue is considerably longer and more lightly padded for extra comfort compared to other fashion sneakers. It’s a highly affordable option at its price tag of $70. These men’s Adidas Campus shoes are offered in sizes 6.5 up to 14. According to a small number of reviewers, they run narrow. A more lightweight and flexible vulcanized outsole along with extra durable materials let the Adidas Campus Vulc Mid stand out in the collection. This skateboarding sneaker is also suitable for lifestyle wear, offering the best of both worlds. It has an extended collar to support the ankle, giving it a distinct flamboyant appeal. Geofit technology is used on the collar for extra support and comfort. At a price of $75, these kicks are deemed to be easy on the pocket. These Adidas shoes in the Campus collection were released in men’s 6-14. They fit as expected. Launched in 2018, the Adidas Stitch and Turn Pack consisted of such classic suede models as the Campus and Gazelle. They were redone in solid and simple colorways for a fresh and modern perspective with a retro touch. With their luxurious allure, these Adidas Campus sneakers offer a versatile style that can be worn for any day. The sneaker’s name comes from the Stitch and Turn technique of sewing, in which a reverse seam method is used. As a result, the Three Stripes and Trefoil logos have an embossed look. It retailed at a reasonable price tag of $100. These Adidas Campus shoes are available in women’s 5-11 and men’s 4-14. A few buyers thought that the shoe runs big, suggesting that a half size down than one’s usual size would be more suitable. This shoe is one of the kicks in the Adidas Pride Pack. Its upper showcases a smooth and simple design done in a cream white color for a classic touch. Meanwhile, the colorful rainbow Three Stripes detail is done in pony hair, offering a progressive stand in support of the worthy LGBT cause. On the tongue is a label bearing the “Better Together” slogan. Premium pigskin nubuck material is used throughout the sneaker’s upper, giving it a plush appeal. These Adidas shoes from the Campus series have a budget-friendly price of $90. Men’s sizes are offered from 4-14. Women could also go down in the sizing by 1.5 to get a proper fit. The second version of the well-loved Campus sneaker was upgraded with an improved fit along with a wider width compared to its predecessor. Classic detailing is retained in this model, which showcases the original silhouette of the timeless Campus. Meanwhile, modern accents elevate this shoe to a contemporary classic. It has a reinforced toe cap that provides much-improved support for the foot. These Adidas Campus sneakers are offered at a low price of $65. Sizes were issued in men’s 5-15, running true to size. One of the signature details of the Campus sneaker was its suede upper. This time, the material was replaced with mesh in the Adidas Campus Mesh, making this shoe more lightweight and breathable than the original. Timeless details of the classic model were retained, while the two-toned pattern on the upper gives it a unique and modern finish. The durable outsole has a herringbone pattern that provides reliable traction. At a price of $70, these Adidas Campus shoes deliver bang for the buck. It was released in men’s sizes from 6-12. It fits as expected. Ladies can get their size by going down by 1.5 sizes. Released on January 13, 2018, the Adidas Campus CNY was part of the Adidas Chinese New Year Pack. For this series, the brand chose classic silhouettes from the Originals line, including the Superstar 80s, NMD R2, and more. For the Campus CNY, the excellent details of the original that so many people loved are retained, updated with festive details to suit the event. In celebration of the event, the sneakers don the Chinese blessing symbol "shou,” which stands for longevity. At a price point of $110, these kicks are reasonably priced. These Adidas Campus shoes were released in men’s 8-14 sizes. Many reviewers mentioned that the sneaker runs large in the sizing, suggesting that going down by one size would be more comfortable. The aptly named Adidas Campus Hairy Suede has an upper made up of shaggy suede, giving it a unique and old-school appeal. Those who love vintage kicks could find these Adidas Campus sneakers very attractive, owing to their classic looks with a striking twist. It has a reinforced toe and a rubber cup sole for an extra-durable structure. With a price tag of $100, these kicks provide value for the money. These Adidas Campus shoes are in men’s 5-13 sizes. Ladies are advised to go 1.5 sizes down to get their size. A few found the shoe to run narrow and suggested getting a half size up for a more comfortable fit. These Adidas Campus shoes are offered in blue, yellow, and other eye-catching colorways, making it stand out from other models in the collection. They were introduced during the Spring/Summer 2018 Adicolor series. The Adicolor line has its origins in the 1970s, which was aimed at celebrating street culture through different colors. Soft hues are featured in this sneaker, making it ideal for low-key yet sophisticated looks. This model comes in four colorways that were first seen in 1983: Fairway Green, Sun Yellow, Scarlett Red, and Bluebird, along with orange and navy options. These kicks are easy on the wallet at a price tag of $80. These Adidas Campus shoes were issued in women’s 5-13 and men’s 3-14. A few wearers found the sneaker to be a tad big, so they suggested that others go down by half a size. The Adidas Campus has plenty of collaborations, from such highly recognizable brands as House of Pain, UNDFTF, Bape, and more. Another noteworthy collaborative edition is with Alltimers, a leading online marketplace for men and women. The brand released the “Perfect for Everything” pack with Adidas, taking inspiration from subtle tones and retro sports equipment. This version of the Campus sneaker is a reworking of the classic silhouette, which has been updated with signature Alltimers accents. The shoe was also redone to make it perfect for skateboarding. Bold designs, retro colors, and ultra-durable materials elevate this shoe for the streets and the skate park. On the heel clip is a textured Teasel suede detail that adds a modern touch. Vintage details and embroidery are seen throughout the shoe. This model also comes with a reusable footwear bag. Its recessed eyelets are meant to protect the laces during hardwearing skate sessions. From the Campus series, these Adidas shoes are priced at a budget-friendly $80. 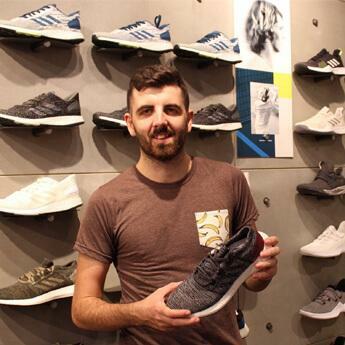 According to a few purchasers, the sneaker runs narrow. Men’s 6-14 sizes are offered. In 2017, Adidas gave the Campus shoe an outdoor iteration in collaboration with White Mountaineering, a Japanese streetwear label. The brand, which was founded in 2006, is based in Tokyo and is distinguished for its unique take on legendary shoes. They are known for incorporating high-performance features on street-ready apparel and more. In this version, the sneaker’s pigskin nubuck upper is weatherized to make it suitable for any day, rain or shine. Meanwhile, signature White Mountaineering details influence the overall design of the model. This shoe is ready to take on different terrains, keeping the wearer comfortable and protected while looking stylish. These Adidas Campus shoes were issued in black and navy colorways. For branding, this model sports a small Adidas Trefoil logo on the tongue, which sits on top of the three-lined White Mountaineering “V” logo. This sneaker is considered to be averagely priced at $130. Men’s 7-12 were issued for the sizes. A couple of wide-footed users found the sneaker to be rather narrow. From the Campus collection, these Adidas shoes were made in partnership with the NBA. Many colorways were released, inspired by the colors of the different teams. Leather suede makes up the upper for a durable structure. The heel is also padded and well-cushioned for extra comfort, while the timeless details of the original model remain. These Adidas Campus sneakers offer basketball fans a chance to wear their team colors in support of the sport they love. Different options are available, consisting of versions for the teams Orlando Magic, Philadelphia 76ers, San Antonio Spurs, Chicago Bulls, Golden State Warriors, and the Sacramento Kings. These kicks feature a distinct 1980s basketball shoe silhouette. They are low priced yet worthy kicks at $65. Sizes are in men’s 6-14. Women should go 1.5 sizes down to get a good fit. Several reviewers have said that the model runs small. 1. How to care for Adidas Campus shoes? Like any other Adidas sneaker, Adidas Campus kicks need to be taken care of properly so that they will last longer. Aside from regular cleaning, there are also other ways to keep the shoes looking good. Here are a few tips to follow. Retain the sneaker’s shape by using a shoe tree, which is widely available at different footwear stores. Other people have also used the cardboard inserts that come with the kicks. Before storing away, make sure to air out the sneakers in the open for a while to get rid of any odors. Leather kicks should be cleaned with leather polish, which not only shines the shoe but also keeps it protected. This way, the leather material won't get worn out too quickly. Never put the shoes in the washing machine. Doing this could cause the sneaker to lose its shape, color or overall quality. Washing by hand is the appropriate way to clean it. 2. How could one style women’s and men’s Adidas Campus sneakers? As sports-inspired kicks with a retro touch, Adidas Campus models are deemed to be highly versatile when it comes to styling options. Shoes in the collection that are used for both skate and lifestyle are also very easy to style, according to reviewers. Below are some of the styling tips that one could follow for Campus sneakers. For men’s Adidas Campus shoes, they could be worn with such skate essentials as shorts and a t-shirt. Jeans, chinos, shorts, and joggers are also good options. For a street-ready look, the outfit could be completed with a bomber or denim jacket. Meanwhile, women can style Adidas Campus models with jeans, shorts, joggers or leggings for a sporty chic look. For any occasion, the kicks could be paired with skirts or dresses, especially models with soft colorways, such as the Adidas Campus Adicolor. 3. What is the price range of Adidas Campus kicks? Adidas Campus sneakers are usually in the budget-friendly to the averagely priced range, from $65 up to $130. The original Adidas Campus retails for $90, while lower-priced models such as the Adidas Campus 2. In the reasonably priced category, there’s the Adidas Campus Stitch and Turn, among others. Finally, slightly expensive kicks from the collection include the Adidas White Mountaineering Campus 80s collaboration, priced at $130. 4. Where can I buy men’s and women’s Adidas Campus shoes? Like many of the models from the Adidas range, the Adidas Campus could be bought at any of the brand’s retail stores and outlets worldwide, depending on the availability. Likewise, the shoes could also be purchased at the Adidas official online store. 5. How could one clean Adidas Campus footwear? There are proper ways on how one could clean Adidas Campus models. These steps also apply to the rest of the shoes from the brand’s catalog, depending on the upper material. The following are the tips laid out on the Adidas website. They are necessary to retain the shape, color, and quality of the kicks. Knock the outsoles against each other to dislodge any loose dust and small pebbles that may have been stuck along the grooves of the sole. Mix warm water with a mild detergent to create a non-abrasive cleaning solution. Using a piece of cloth, gently apply the mixture on the shoe’s upper material to wipe away dirt and stains. Rinse off any excess solution or dirt using a cloth dipped in warm water, dabbing gently at the sneaker’s material. To dry the footwear, keep them out in the open in room temperature. Do not use any type of heater as it could damage the material. For the insoles, if they are removable make sure to air them out to get rid of odors. Sprinkling baking soda on the insoles is also said to be effective in driving away the smell. As most Adidas Campus sneakers are made up of suede, make sure to brush them with a special suede or bristle brush to maintain the quality of the material. Shoelaces should be washed separately in a bowl of water and soap, then air dried. 6. How much do Adidas Campus shoes weigh? The majority of Adidas Campus models have been found to be reasonably lightweight by reviewers. Although they are inspired by sports, users have not complained of the kicks being bulky or heavy. They are often praised for the light feel that they deliver. Skate kicks from the collection such as the Adidas Campus Vulc II ADV, Adidas Campus Vulc Mid, and the Adidas Campus x Alltimers are known to have a vulcanized outsole with vector traction. This feature offers a lightweight feel. To give one an idea, the Adidas Campus Vulc II weighs at 397 grams, deemed to be light by most users, while the Adidas Campus Stitch and Turn is another lightweight model at 425 grams. Other shoes in the series that have been known for being particularly lightweight include the Adidas Campus 2, Adidas Campus Mesh, and the Adidas Campus CNY, among others. 7. Where are Adidas Campus sneakers made? Adidas manufactures most of its footwear products overseas, in factories that are mostly located in Asia. The brand has released a list of its factories around the world, including those that are in Thailand, China, Indonesia, China, Vietnam, and Turkey. To find out where a particular shoe was made, look at the label on the tongue, where the “Made in…” information is usually printed. 8. Where to buy Adidas Campus shoes aside from Adidas stores? As a famous sports brand, there is a wide availability of Adidas products at different stores. Department stores and big footwear chains are known for carrying specific models, including Adidas Campus footwear. Online, one could head over to the websites of giant footwear retailers such as Zappos and Amazon. Some sneakers could also be found at reseller websites such as eBay. 9. What technologies are used on Adidas Campus kicks? Adidas Campus models are known for being relatively low-key. As such, they are not as infused with technologies as other sneakers in the brand’s catalog. However, they do offer excellent features that have made them well-loved by many. Comfort, breathability, a lightweight feel, and durability are signature elements of the Campus collection. Moreover, a lot of the shoes in the collection have a vulcanized outsole with vector traction or herringbone pattern on the outsole. This detail offers reliable traction and support for any surface. 10. How to determine how Adidas Campus shoes fit? Shoes in the Adidas Campus collection are usually offered in men's sizes, ranging from 6 to 14. Some models are issued in more sizes. They are in medium width. Many sneakers fit as expected or run true to size. On the other hand, some models also have a narrow, small or large fit, in which case buyers will have to size up or down. There are only a few women’s shoes in the Campus line, such as the Adidas Campus Stitch and Turn, which is offered in sizes 5-11. Another one is the Adidas Campus Adicolor, available in women’s 5-13. However, there a lot of Adidas Campus men’s shoes that could be suitable for women if they go down by 1.5 sizes.